The Peerless Industries 15U A/V Component Rack System is a fully assembled rack system designed to house audio/video components. Equipped with strong and sturdy steel shelves, the Rack System is designed to hold a wide range of components and provides easy access to the components from the top, front, and sides. Vented panels allow sufficient air flow, thereby cooling the components in the rack. With an integrated cable management system, the 15U A/V Component Rack System assists with routing multiple bundles of cables for a clean and professional look. In addition, the rack can be moved easily with the help of removable handles and rubber casters. 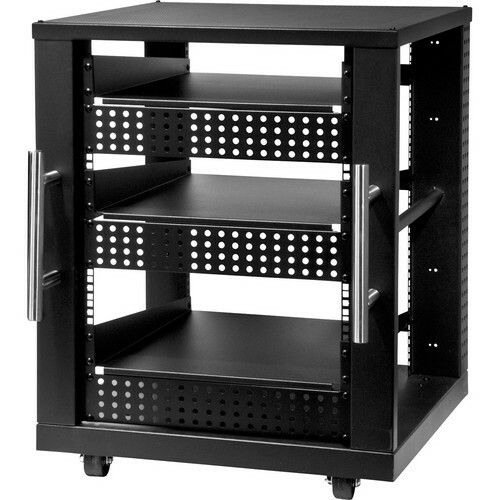 Box Dimensions (LxWxH) 36.0 x 27.0 x 26.0"
15U A/V Component Rack System is rated 3.5 out of 5 by 6. Rated 3 out of 5 by TazGTR from Would be great if they packaged it better This unit was bought for a church and it need to be put in right away. When it was received it had been damaged. Because we need it that day we took it any way. When we opened the box it was missing foam on the bottom of the unit. The damage was was bad enough that we needed a wood block and a hammer to make it presentable and functional. Even with it loaded it still doesn't sit flat. It rocks back and forth on the casters. Other than this the unit went together easy and came with hardware to mount equipment. We will not recomend this item to anyone. Rated 3 out of 5 by RCDD with 20+ years of specifying from Not so thrilled I purchased this to house my equipment now that I moved into a small condo. List of equipment includes: Cable modem, Linksys router, rack mount power strip, stereo receiver, and laser printer, with a 32 LCD TV set on top. My issues with the product itself: It is from China. I find it very difficult to believe that something this large and heavy actually saves money for a company, when you consider sending a palletized steel product across the Pacific. I buy nearly everything online and carefully search each product to wean this out, but did not catch it for this. Additionally, the bottom of the front was dented and one shelf was dented and scratched, even though the packaging looked fine, so I have to assume whoever packaged it didn't notice or care. Several of the fasteners installed at the factory were loose, some so much so that the nuts had come loose and were detached. It comes with three ventilated front panels, and I found it odd that one of the three was manufactured differently from the other two. Even with just a 32 Samsung LCD on top, the TV rocks a bit due to sag in the metal. It does what I need, but I would not recommend to a friend without detailed reservations. Rated 2 out of 5 by DF from Nice idea, bad execution It's true what they say, bad packaging damaged the part inside and screws inside were loose and came out. Scratches on the shelves from accessories packaged. Part is very very wide, 6 inches wider than it needs to be in my opinion. Rated 4 out of 5 by Andrzej from Good Rack, Horrible Delivery. Rack itself well made and good looking especially if you like industrial style, A little too big for the purpose imo (at least for standard audio equipment). Minor things: -couldn't attach cable holders with screws provided -attachment for small masking panels missing Delivery is another story. Simply inhuman. One poor guy. Truck without the lift. Before he managed to get down over 100 pounds package it lost half of protective cartoon. Equipped with small dolly he couldn't go over the curb. Steps were impossible. Although I am not supposed to lift heavy things I had no other choice but help. Using some tricks we were able to lift it over thru balcony. Thanks to delivery man (and good amount of luck) the rack stayed pretty much undamaged but I am not surprised reading other comments. I hope B&H is not directly responsible for third party operations and still remain my favorite place to do shopping.. Rated 5 out of 5 by Anonymous from 15U A/V Component Rack System by Peerless-AV Well built and sturdy. Only minimal assembly required for the wheels and cable management. I bought this unit to house my 73 lb. 5 channel amplifier along with my other Home Theater equipment in a small closet. Portability was essential. This unit will last a lifetime. Already have the larger unit in another closet.